1. How do you assess the progress of the judicial reform in Ukraine? Ukraine has seen meaningful changes to the country’s judiciary since the Maidan Revolution. This includes amendments to the Constitution, adoption of the Law on the Judiciary and the Status of Judges, changes to Ukraine’s key procedure laws such as the Code of Civil Procedure, the Code of Commercial Procedure, and the Code of Administrative Procedure, the election of a new Supreme Court, appointment judges to the Constitutional Court, as well as the introduction of the right of individual constitutional complaint and the adoption of Rules of procedure by the Constitutional Court. As a result, Ukraine has simplified its court system and substantially widened the authority of the Supreme and Constitutional courts. These developments are illustrative both of how change can be carried out if the necessary political will is there. 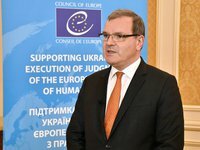 The short-term indicators of the progress made are the increase of the number of judgments of the European Court of Human Rights executed by Ukraine, as well as the decrease of applications to the European Court of Human Rights against Ukraine. The long-term indicator is the trust of the population in its Judiciary, which should result from the reform process. 2. How do you assess the process of renewal of the judiciary in Ukraine? How efficient the activity of the HQCJU is? The High Qualification Commission of Judges of Ukraine played a decisive role in the reform the judicial system of Ukraine. I am impressed by the work done by the HQCJ over the last two years. ’s experience during the selection of the Supreme Court judges is truly unique to the European countries. All eyes inside and outside Ukraine during this process were on the Commission, which checked, investigated where warranted, and examined the candidatures to the Supreme Court. It applied a thorough procedure, according to the Law, with a view to selecting judges to the Supreme Court of the highest level of professional competence and personal integrity. Following closely the work of the newly formed Supreme Court, I believe that HQCJ performed this task efficiently and with success. The current challenges of the HQCJ are now the evaluation of all judges of Ukraine, the competition for judges of the IP, the second competition to the Supreme Court and the transfer judges to the newly created courts in accordance with the Presidential Decree of Ukraine dated December 29, 2017 No. 449/2017 "On the Elimination and Creation of Local General Courts". This represents a considerable challenge and I am convinced that the Commission will continue to accomplish its very demanding mandate in a professional and efficient manner. 3. How do you assess the civil society representatives’ participation in the evaluation of the judiciary? How do you assess the activity of the Public Council of Integrity (PIC)? How to ensure the balance if the opinions of the HQCJ and PIC differ? What qualities should be preferred – professionalism or personal qualities of the candidate? Ukraine introduced an innovative approach for the participation of the civil society in the process of selection of judges. This was provided by the Law on the Judiciary and the Status of Judges through the creation of the Public Integrity Council, a body of the NGOs representatives, practicing lawyers and journalists, to provide advice to the High Qualification Commission of Judges of Ukraine in the process of the qualification assessment of judges. The Public Integrity Council made a great contribution to the selection process of the new Supreme Court judges. It provided an additional guarantee to the transparency of the procedure. This is essential in order to overcome the traditional lack of public trust in the Judiciary. I understand that at the end of the selection of the judges to the new Supreme Court, several civil society representatives, including PIC members, view the process with a high degree of suspicion and scepticism. I encourage the HQCJ and PIC to restore dialogue, fully respecting the provisions of the Law, since their common goal, also shared by the Council of Europe and other international Organisations, is to ensure the highest possible professionalism and integrity among the Judiciary. Diverging opinions and dialogue are part of a democratic process. The This should be oriented towards finding constructive solutions in order to achieve the expected result. Thus, the HQCJ and PIC will play a decisive role in order to increase the level of public confidence in the Judiciary. I would like to refer to the European Charter on the statute for judges of July 1998, when answering the question about what qualities should be preferred for the candidate for the post of judge. This document indicates : ‘…. that during selection process the main aim must be to evaluate the candidate’s ability to assess independently cases heard by judges, which implies independent thinking. The ability to show impartiality in the exercise of judicial functions is also an essential element. The ability to apply the law refers both to knowledge of the law and the capacity to put it into practice, which are two different things. The selection body must also ensure that the candidate’s conduct as a judge will be based on respect for human dignity, which is vital in encounters between persons in positions of power and the litigants, who are often people in great difficulties. Lastly, selection must not be based on discriminatory criteria relating to gender, ethnic or social origin, philosophical or political opinions or religious convictions’. 4. From your point of view, to what extent to create the Anticorruption Court is essential for Ukraine? Whether the Ukrainian society is prepared for it? How effectively to establish the composition of the Anticorruption Court panel of judges? What role might play the civil society in the establishment of the composition of Anticorruption Court? The fight against corruption should be considered as a high-level priority in every democracy. The Ukrainian society, as well as the international community, have high expectations to combat this phenomenon in the country without further delay. Ukraine has undertaken to establish a High Anti-Corruption Court. The 2016 Law “On the Judicial System and the Status of Judges” (LJSJ) provided for the establishment of such a Court. Despite the establishment in 2016 of specialised law-enforcement bodies competent for significant corruption cases (NABU, SAPO), there are so far no convictions in such cases. The setting up of High Anti-Corruption Court will represent a major step in this respect provided that it is established in full compliance of the Venice Commission’s recommendations. 5. How do you assess the effectiveness of the new Supreme Court? The new Supreme Court has already taken important decisions. I would like to mention one example: the decision concerning pensions to Internally displaced persons (https://supreme.court.gov.ua/supreme/pro_sud/zrazkova-sprava/zrazkova_9901_20_18), which is a principal decision and may impact the lives of many Ukrainian citizens. This is a promising start and I trust that the Court will continue its important work of the consolidation of the rule of law and the respect of human rights in Ukraine. 6. How do you assess the Ukrainian activity towards the protection of its interests in the international courts, in particular, as to the assets, which remained on the ungoverned territories in the Eastern regions and in Crimea? Ukraine, like every sovereign State, protects its interests through the various mechanisms provided by international law. In this regard, the Council of Europe position is expressed by the PACE Resolutions and Recommendations and by the Committee of Ministers decisions.